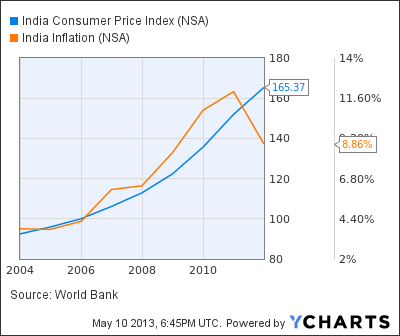 Huge India Home Price Bubble Ready To Burst! Here are some interesting charts by Deepak Shenoy on the India Housing Bubble. 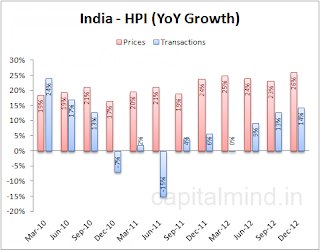 India home prices have been going up at a compound annual growth rate (CAGR) of 26% since March of 2009. Shenoy reports Mumbai is growing at a CAGR of 30%, and Dehli is up 47% from a year ago and 250% since March 2009. Note the transaction volume in Delhi. Transaction volumes and prices are interesting in Bangalore and Chennai as well. Shenoy has details on five other cities as well. Inquiring minds may wish to take a look. I would suggest that India as a composite certainly is in a housing bubble. 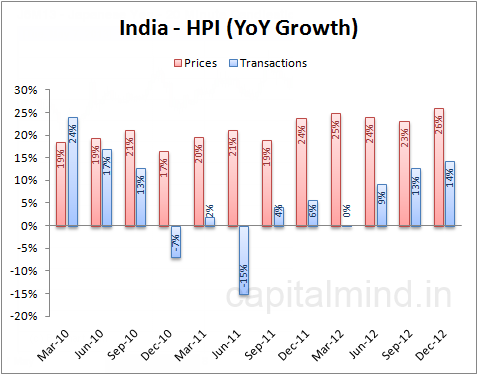 The overall HPI shows just that. Home prices have increased far more rapidly than reported inflation, which I propose is hugely understated. Inflation measures typically do not reflect actual property prices and certainly do not reflect other asset bubbles. For a discussion, please see Hugely Negative Real Interest Rates Fuel Yet Another Housing Bubble; A Word About “Inflation” and Treasury Yields.